How Do They Make Cocaine on the Streets? According to the National Institute on Drug Abuse, cocaine is one of the most commonly abused illicit drugs in the U.S. after marijuana and heroin. Cocaine overdose victims comprise close to 10 percent of all admissions to public-funded addiction and substance abuse treatment programs. Now here’s a shocker. Cocaine is one of the most expensive illicit drugs that are around. Findings from the Global Drug Survey of 2015 suggest that a gram of cocaine costs approximately 80 USD! You cannot be blamed if you wonder, “What is cocaine made of? But before delving into the details of how cocaine is made, wouldn’t you like to know just what is this substance that people are willing to pay an arm and a leg for? It can be difficult to tell what is in cocaine considering it is easy to dilute it, or “cut” it, by mixing it with other substances. Cocaine is made of extract from coca leaves. However, it can be cut with other ingredients such as cornstarch, talcum powder, powdered sugar, powdered milk, or other drugs like amphetamines or caffeine. Cocaine is a drug that stimulates the central nervous system and also has anesthetic properties. It is derived from the leaves of the coca plant (Erythroxylum coca). Yes, there is a coca plant! The coca plant is native to South America. The CNS-stimulating effects of cocaine were known to the South American people for thousands of years. They chewed the leaves whenever they wanted an energy boost. The “coca plant” is comparatively harmless. On the other hand, the cocaine that is synthesized from its leaves is a powerfully addictive substance with many short- and long-term adverse effects. The immediate effects of cocaine include feelings of euphoria and increased physical energy and mental alertness. Adverse effects like elevated body temperature, headache, abdominal pain, and nausea also accompany these feelings of high. An overdose of cocaine can cause abnormal heart rhythms, seizures, heart attack, stroke, and coma. Long-term abuse of cocaine causes nasal damage, trouble swallowing, weight loss and nutritional deficiency, and damage to bowel tissues resulting from decreased blood flow. In the U.S., cocaine is classified as a Schedule II drug, which means that it has a high potential for misuse. Some of cocaine street names: Crack, Coke, Rock, Snow, Blow, Candy, Charlie, Flake, or Toot. Despite the fact, that cocaine is derived from coca leaves and should be natural, the street drug is processed in private manufacturing facilities. Dried coca leaves contain only up to 1 percent cocaine. The street drug cocaine is processed from coca leaves to produce cocaine hydrochloride. Cocaine is made from processing the leaves of a coca plant by either solvent extraction or acid extraction. The leaves are picked from the coca plant and are processed into a paste. The paste is then purified to produce coca base, which is then transformed into cocaine hydrochloride, the powdered form of cocaine. When you know how do they make cocaine, you will realize that it is a lengthy, tedious, and precise process, which probably explains the high price tag. Besides, what is cocaine made of—the impurities present in it and the various substances manufacturers add to it to bulk it up—determines the strength of the drug and its effects. After plucking, coca leaves are dried till they are brittle. Else they are transferred immediately to the manufacturing facility to start the filtering process. It is critical that the leaves remain dry, else they will rot. To make cocaine, coca leaves are processed to produce crude coca paste. The paste is purified to produce coca base that is then converted to cocaine hydrochloride. PubChem, an open database maintained by the National Institutes of Health, describes in detail how to make coke. Coca paste can be processed from coca leaves in two ways: by solvent extraction or acid extraction. Solvent extraction is the traditional way to make cocaine paste. 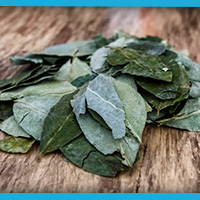 Dried and finely ground coca leaves are dusted with an inorganic base like lime or a carbonate salt and moistened with water. Then an organic solvent—kerosene or less commonly, gasoline or diesel—is added to the slurry and mixed vigorously. Sometimes this mixture is left standing for a couple of days and stirred occasionally. This process separates the cocaine from the leaves. The efficiency of the extraction process depends on how fine the coca leaves had been chopped and for how long the coca leaves-lime/salt mixture had been doused in the organic solvent. Nowadays, mechanization—using leaf mulchers to grind the coca leaves and cement mixers or washing machines to mix the organic solvent and leaf/lime/salt slurry—has made it possible to extract more cocaine. However, the extracted cocaine is still dissolved in the solvent. The mixture is heated to remove the remnants of wax from the leaves. The solvent is then extracted from the vegetable matter by filtering, pressing, siphoning, or draining from a plug. The extracted solution is mixed with dilute sulfuric acid to convert the cocaine to cocaine sulfate. The mixture is allowed to sit to separate the organic solvent leaving behind an aqueous solution that contains the cocaine sulfate. To separate the cocaine sulfate from the sulfuric acid, lime or caustic soda is added to the aqueous solution. This neutralizes the acid and converts the cocaine sulfate to its free base form that precipitates out as a yellow, gummy solid. This is coca paste. This is a more labor-intensive process than the solvent extraction method. In the acid extraction process, dried coca leaves are mixed with dilute sulfuric acid in a pit. Workers in the manufacturing facilities get in the pit and vigorously stomp on this mixture for 1-2 hours. The acid converts the cocaine to cocaine sulfate. This mixture is then heated to remove the wax from the leaves and filtered to remove the vegetable matter from the aqueous acidic solution containing the cocaine sulfate. There are 3-5 stages of extraction of the coca leaves. After stomping once, a fresh solution of dilute sulfuric acid is added, and workers stomp on the leaves again. Lime or carbonate is added to the isolated diluted sulfuric acid-cocaine sulfate solution, and the mixture is stirred vigorously. This neutralizes the acid, and a curdled mass of coca paste precipitates out. But this cocaine sulfate paste is not easy to be collected. So it is mixed with kerosene, stirred vigorously, and allowed to sit for some time. This mixture is then filtered to separate the paste. The coca paste is not the typical street drug that users ingest, inject, or inhale. The street drug is cocaine hydrochloride that is available in powder form or as crack. The coca paste has to be purified because it contains impurities like cinnamoyl cocaine that were present in the coca leaves. If the coca paste is not purified, the final cocaine product is of more inferior quality regarding cocaine content and color. To purify, the coca paste is dissolved in dilute sulfuric acid and potassium permanganate. The latter is a powerful oxidizing agent that reacts with the oxidizable impurities in the coca paste to produce manganese dioxide. Manganese dioxide is an insoluble solid that can be easily filtered out of the solution. Potassium permanganate is continuously but slowly added to the solution and the solution is stirred vigorously. The mixture is allowed to settle down. If there are impurities in the paste, manganese dioxide forms as sediment. This process is repeated till the solution turns colorless and no manganese dioxide is formed. Finally, the colorless, acidic solution is filtered and diluted ammonia is added to it to neutralize the sulfuric acid and cocaine sulfate. A purified coke precipitates out that is then filtered and dried to produce cocaine hydrochloride. 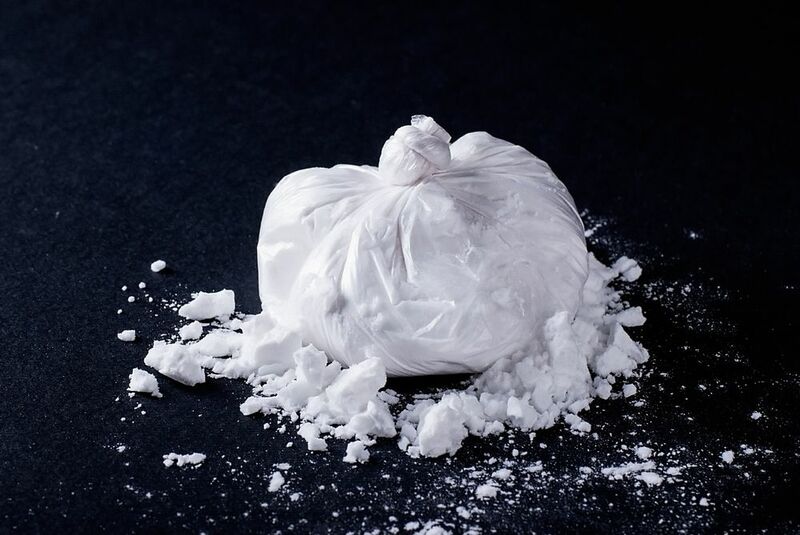 Cocaine is available on the streets either as cocaine hydrochloride, a powder-like water-soluble substance that can be ingested and snorted or crack cocaine, which is a solid rock crystal that is heated and smoked. Street dealers usually dilute cocaine hydrochloride with other substances like cornstarch, glucose, lactose, bicarbonate soda, and talcum powder to increase bulk and make profits. Some dealers add amphetamines (a psychoactive stimulant), caffeine, and procaine (an anesthetic that is chemically similar to cocaine) to magnify the numbing and stimulating effects of cocaine. Users snort this white powder or rub it on their gums. Many dissolve it in water and inject the solution into their veins. Crack cocaine is a base form of cocaine that is obtained by processing cocaine hydrochloride, salt, with ammonia or sodium bicarbonate and water. The resultant substance is heated to remove hydrochloride and obtain crack with a high degree of purity. Crack is the most potent form of cocaine. Cocaine, or cocaine hydrochloride, presents as a powder, which can be snorted, rubbed on the gums, or dissolved into water and injected. Crack cocaine is the result processing cocaine hydrochloride to remove the hydrochloride, essentially purifying it. Crack rocks are heated to produce fumes which the user inhales. Users heat crack cocaine in a glass pipe and inhale the vapors that reach the lungs and are absorbed into the bloodstream almost as quickly as when diluted cocaine hydrochloride is injected. The effects of high are similar in both instances. The cracking sounds produced when the rock crystal is heated inspired the moniker. The instant feeling of euphoria that the drug induces in users is the prime reason for cocaine’s popularity. The potency of cocaine depends on the purity and quality of the drug. When you know how cocaine is made, you realize the lengths to which manufacturers go to create a powerfully addictive substance and why they do so. thanks a lot for the help with my chemistry project! you saved me from getting an F!!! I loved learning about cocaine for my school project! So fun!! Cocaine is so interesting I never knew it was from a plant! Many thanks! El chapo guzman brought me here! Great recipe will have to try!